Speedmaster Broad Arrow or Speedmaster Professional? It’s Speedy Tuesday! Don’t let the broad arrow hands fool you! Often confused with the Speedmaster Broad Arrow, this Moonphase model is definitely part of the “Speedmaster Professional” collection. This Speedmaster Professional Moonphase is based on the Speedmaster ’57 re-edition ref. 3894.50.37 that was introduced in 1997/1998. It was in production from 1999 till 2003 and has the famous hand-wound Lemania based caliber 1866 movement. This is a modified version of the caliber 1861 movement, that can be found in the current line-up of Speedmaster Professional ‘Moonwatch’ timepieces. This Speedmaster Professional Moon Phase ref. 3575.20 clearly has ‘Professional’ written on the dial, but there just seems to be some confusion all the time about the Moonwatch and all the different varieties on it. The easiest way to tell a ‘Moonwatch’ or ‘Professional’ from other Speedmaster variations is the hand-wound movement (exceptions are the quartz/digital models of course, like the Speedmaster Pro X-33). You probably are familiar with the white gold Speedmaster Professional with a Moonphase complication (ref. 3689.30.31). 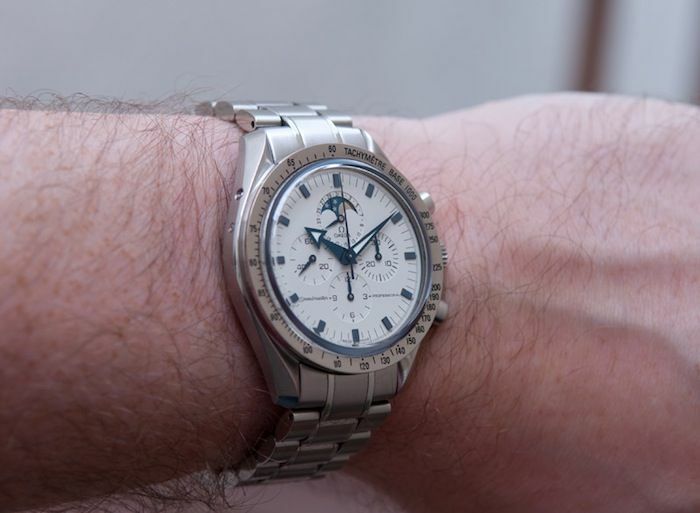 This (much) cheaper reference 3575.20 Speedmaster Pro Moonphase also has a white gold element! As you might see on the picture above, the bezel has a slightly different tone than the case and bracelet. It is an 18 carat white gold bezel. Where the white gold bezel on the Speedy Pro Moonphase (ref. 3689.30.31) has a black aluminum inlay with the tachymeter scale, this solid white gold bezel on the ref. 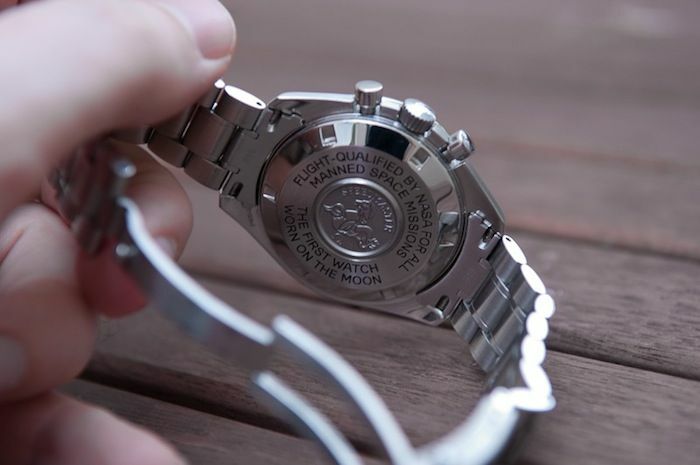 3575.20 Speedy is just one piece with an engraved tachymeter scale. Also on the photo below, you can probably see the different tone of the bezel compared to the case and bracelet. As you can see on the photo above, the corrector for the calendar and moon phases are located on the left side of the case. The watch comes with a corrector (picture below shows the corrector in its small leather protector) that can be used to adjust these pushers. One of the flaws with these watches is that these correctors get dust and other stuff inside which results in either a bit of resistance when operating them or either no functionality at all anymore. Cleaning with warm water and a soft tooth brush might help and otherwise a quick service at your watchmaker. However, my personal take on this is that you should always calculate a service overhaul in the price you bid or offer on a pre-owned timepiece this age (or older). Consult your OMEGA dealer for the actual prices on servicing watches. There are a few price differences when it comes to servicing older watches or more complicated watches. I truly think the Speedmaster Professional Moonphase reference 3575.20 is an awesome watch, both on a stainless steel bracelet (ref.1998) or a leather alligator strap. The fact that it has a moon phase complication and a calendar is a nice addition to the otherwise ‘basic’ Speedmaster Professional with hand-wound movement. The dial – that is rather cream colored than white – has blue hour indicators and the hands are blue as well. This makes it a very legible dial. One of the things I am not particularly fond of is the engraving in the caseback. Although I like it very much in the regular Speedmaster Professional ‘Moonwatch’ (ref.3570.50), it does not make sense in this Moonphase variation. This is not the watch that is flight-qualified for NASA missions nor was it the first watch worn on the Moon with this moonphase complication. 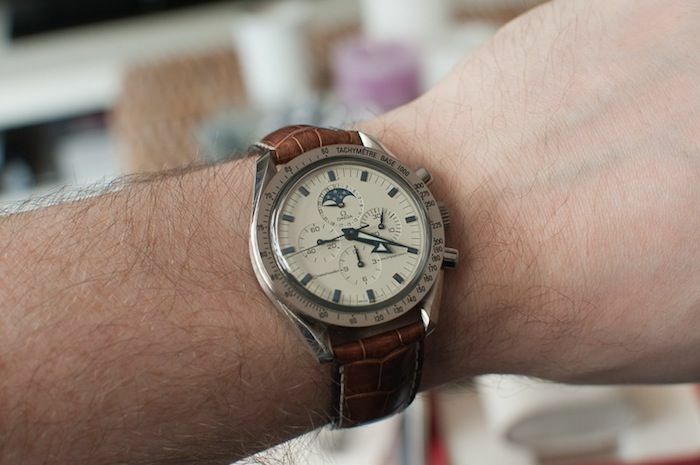 I understand that some people will enjoy the fact that OMEGA paid tribute to their Moonlanding heritage with this caseback on a Moonphase watch, but I would rather have seen either a transparent caseback showing the beautiful Lemania movement or a caseback with just the Seamonster engraving and ‘Speedmaster’ wording. I guess I am a Speedy purist anyway. A very short production time might be the cause of only a limited availability on the pre-owned market of these Speedmaster Professional Moon Phase models. We currently only found 5 of them for sale on the biggest watch market platform (Chrono24) on-line with prices between 2950 and 3500 Euro. For vintage purchases and for watches that are older than 2000, OMEGA has a very nice service in place that enables you to order an extract of the archive of your watch. Go to this page and fill out the details. For 75 Swiss Francs, you will receive a nice extract of your watch with details on production and shipping. However, I only advice you to buy this particular model if everything is complete (boxes, instruction book, warranty cards etc). A watch this age should be complete in my opinion. The Speedmaster Professional 3575.20 has initially been offered for sale with either a stainless steel bracelet or a leather strap with a folding clasp. Ordering a spare stainless steel bracelet is more expensive than getting a leather strap for this watch, so look out for the models that come with the stainless steel bracelet. 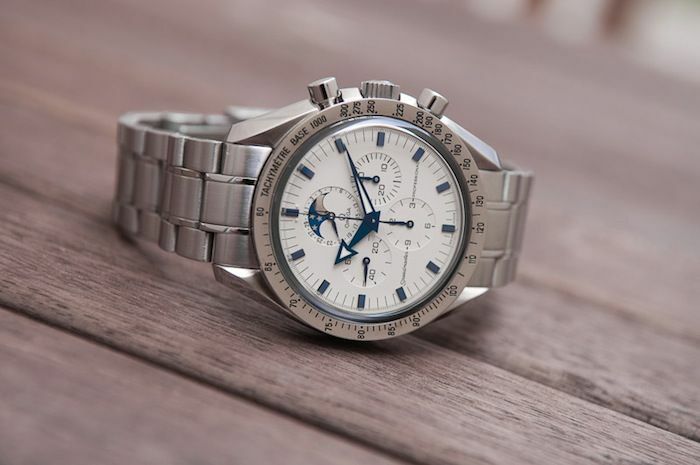 If you have a Speedmaster you want to share with the world on Speedy Tuesday, drop us a line! 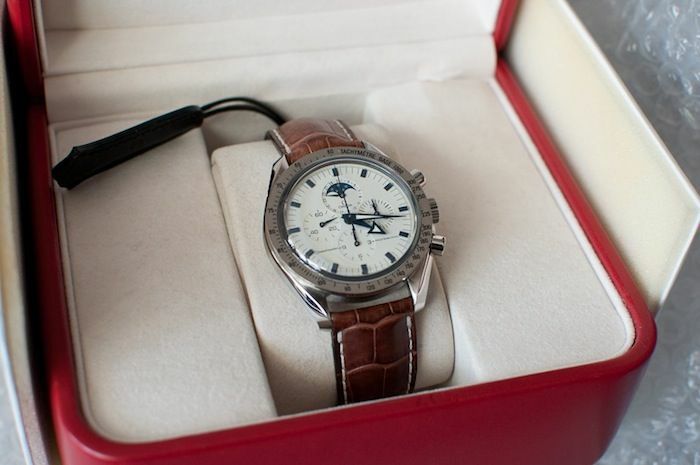 Please visit the official OMEGA website at www.omegawatches.com, they also have a section displaying these out-of-production Speedmaster watches.